This new Azimut motor yacht, which was premiered at the last edition of the Genoa Boat Show, has been designed by Stefano Righini. 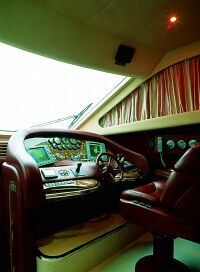 Here, the designer has drawn on his experience gained on other important hulls in this range in order to devise a yacht where, thanks partly to the many technological innovations on board, comfort and the effective use of space set a new benchmark in style. This boat, which replaces the 70 Seajet in the Azimut range, introduces major changes in appearance, above all in the aft zone, where the contemporary flowing curves blend in perfectly with the increased size of the interior. A door in the transom provides direct access from the spacious bathing platform to the engine room and the crew quarters, equipped with two beds, a bathroom and separate shower. 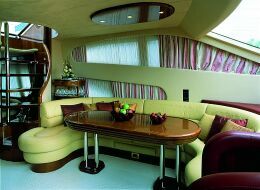 This design feature ensures maximum privacy, in keeping with a first class motor yacht. Other important modifications have been made to the split-level saloon, where the living area is now cosier with the two semicircular settees facing each other. New arrangements have also been introduced for the dinette, the stairs leading down to the guest area and, amidships, the redesigned wheelhouse. As for the interior layout, the vessel we tested is the three-cabin model - a four-version cabin is also available - with the owner's suite located abaft the lower deck. This area, which is already large in itself, appears to have been laid out in exemplary style, with a central double bed, en suite bathroom with Jacuzzi, dressing room and beauty area. 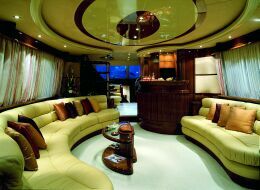 It is very elegantly appointed and characterised by the evocative arrangement of the windows and portholes - three on either side - ensuring a light and airy feel which is hard to come by on other yachts. 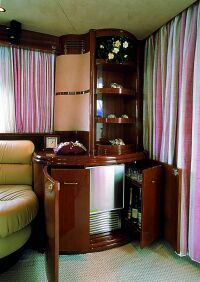 The VIP cabin is right at the bow and is equally impressive in terms of the use of space and fittings. 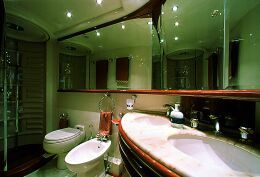 This stateroom also has its own en suite bathroom with a separate shower recess, wardrobe/hanging space and central double bed. The guest cabin is located between the other two and has twin beds, a closet and a bathroom, again with a shower recess. 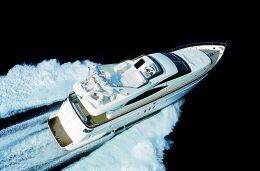 The underwater portion of the Azimut 74 Solar's hull has a gliding bottom; the vee-hull reaches an angle of 14° at the stern. 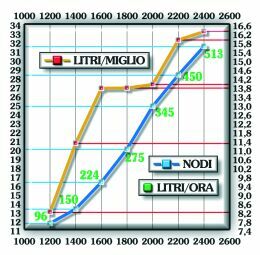 Driven by 4-blade propellers and powered by 2 x 1,300 HP MTUs, on this occasion her performance was in line with our expectations, with an extremely smooth wake at virtually all speeds - a clear sign of the success of the design. Note: There are two possible layouts for the sleeping accommodation a four-cabin version, each stateroom having its own en suite bathroom, plus crew quarters, or the "office" model comprising three cabins with bathrooms, plus crew quarters. Description and characteristics of the flying bridge: dual access to the flybridge deck with stairways from the cockpit and the saloon. Flying bridge with wheelhouse and helm, electronic controls for engines, complete engine instrumentation and control panels, compass, intercom connected to engine room, saloon and cockpit, VHF repeater, ST 6001 Autopilot, Autohelm ST 80 echo sounder and speed indicator. Lights and loudspeakers in the roll bar, upholstered sundeck area, pilot's and co-pilot's seats, settees for 12 passengers with table, bar with sink, fridge and barbecue, GRP roll bar with radar, navigation lights, antennas and search light, yacht tender with 400 kg capacity electric-hydraulic davit for haulage and launch. 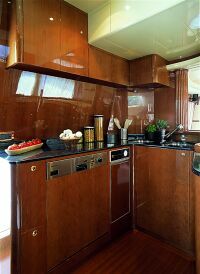 Galley area: separated from the dining area by an elegant structure/bar and serving hatch with granite worktop. Curved linings made of cherry, Miele fittings and, in particular, two sinks, pyroceram four-ring cooker, standard oven and microwave, fridge and freezer, dishwasher, marble worktop, customised Azimut cutlery and crockery for 8. 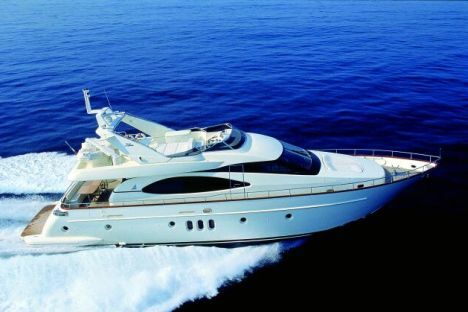 Standard equipment: in addition to that already mentioned, electric-hydraulic flaps, bow rudder propeller, 17.5 kW Kohler generator, centralised fire protection system in the engine room, 80-litre boiler, three grey water and two black water tanks, 100,000 BTU Crusair direct expansion air conditioning throughout the yacht. Electrical panel and systems: of the highest level, offering ample guarantees in terms of reliability.